Alessandro Duranti explores the way traditional oratory in a Samoan village is shaped by the needs of the political process and shows how language insulates ceremonial speakers from the perils of everyday confrontation. He proposes a "moral flow hypothesis" in discourse, to describe a grammar that distributes praise and blame and in that way defines the standing of individuals in the community. 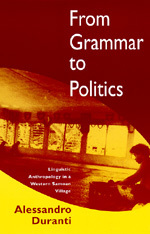 This ethnographic journey from linguistic to political anthropology demonstrates that the analysis of grammar in context needs ethnography just as much as the conduct of politics needs grammatical analysis. Alessandro Duranti is Professor of Anthropology at the University of California, Los Angeles.